The blue dress embroidery is absolutely gorgeous and I think you have that for sale in your Etsy shop. I might just have to purchase that design set! I have Husqvarna Viking Premier Plus software which has all of the stuff in it. I am going to teach myself how to digitize but I just haven’t done it yet. Reading your blog has helped to motivate me I have to say. I know I’ll be able to do it! I am good friends with Liuba from ArtEmbroidery too and she’s willing to give me pointers and such. We are both admins on the group for her embroidery Designs actually. We started that group about a year ago. That red dress though! Wow! What amazing fabric you found for that. 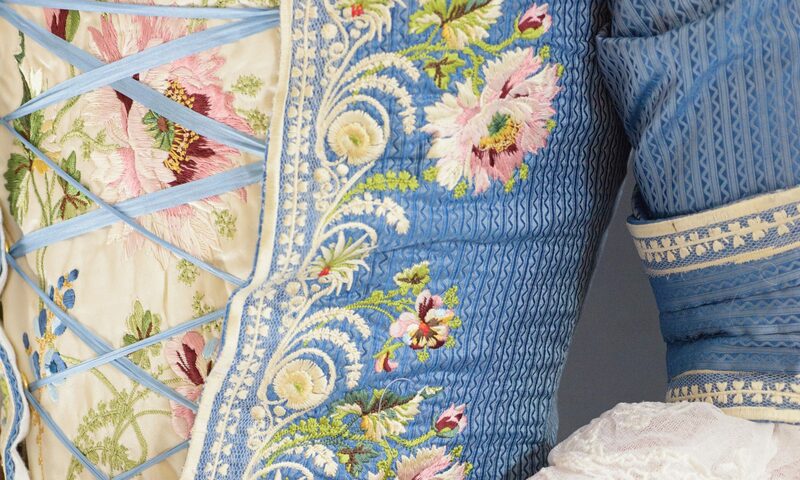 I’ve read the posts on the trim you’re working on and it’s gorgeous as well but the dress itself is in a realm all it’s own just because of the fabric it’s made of. I’m guessing that’s the dress you’ll be wearing at Versailles this year. I mentioned in my other post that I’m in a lot of the same Facebook groups you’re in. You did ask about sources for lace in one of your posts. I’m hesitant to post any comments on there because some of the members are not very pleasant to those of us that are not that dedicated to true and exact HA. Some are quite arrogant if you know what I mean. However, I do have a great supplier of lace on Etsy that I found. She’s based in Switzerland and even though the laces she sells are new, some of them are absolutely perfect for 18th century dresses. I’m still collecting fabrics for my 18th dress but I’ve acquired several laces from her shop, VintageToLiveBy for the engagets. I can send you a link if you can’t find her shop. Browse through her shop periodically though and I can also send you photos of the special ones I’ve found that I’m saving for my gowns if you’d like to see what she does get in stock. Previous PostPrevious Museum of Victoria and Albert Coat – Part 1 of… how many? !